The life of a shinobi is a difficult one. Danger looms behind every sound and in every shadow. The only question is are you willing to look underneath the underneath? The threat of Akatsuki is one that all shinobi are steadily becoming aware of. Their attacks on the villages to capture those individuals known as jinchuuriki have steadily tipped the balances of power. Stress between villages is steadily growing now that these monstrous weapons are being lost, threatening to turn into conflict if the right note is struck. It is in this world of violence and hope that we live in, a world of bloodshed, hatred, and darkness. All is not lost, however. It is in your power to change the world. In the face of devastation, how will you leave this world? Will you leave it a hero or a villain? The world is in your hands. 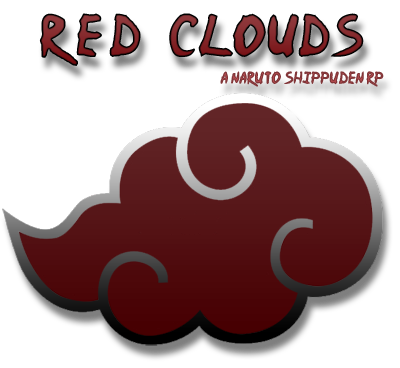 Red Clouds is a roleplaying community that has been around for over THREE YEARS which focuses on the development of each individual character, not only in jutsu and strength, but also in depth. Every character goes through the process of being made balanced and into characters meant to grow. Intimate and thorough long-term plots provide a constant and engaging world of activity that your character can live through. We do not focus simply on canons, but rather the entirety of the world. Each village can run their own plots, each character can live their daily lives, and each character has the potential to grow into a legend. Originality is heavily emphasized. Though Red Clouds is a canon site, original plots and characters tend to take the reins. We operate canon events in this manner as well, as players are welcomed and encouraged to expand and go deeper into anything and everything. As an intermediate to advanced level of writing site, we enjoy our enhanced quality of story-telling.